A little news for those attending SXSW next week AND for those who will only be listening from the cyber sidelines. 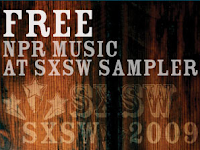 NPR posted a FREE 10 song SXSW sampler download. Artists include Blind Pilot (my favorite), Thao, Avett Brothers, and the Decemberists. Download it here.